New York wedding designer and consultant Anita Pagliaro is now available in the Northwest to oversee any or all of your wedding arrangements. 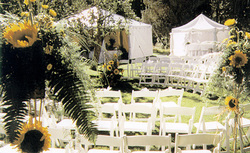 You can have a beautiful wedding in any location, even a remote outdoor setting. Your event will be planned with experience and sophistication. Anita's work has appeared in many publications, including Martha Stewart's Weddings.